The seismic waves generated by earthquakes, when recorded at seismograph stations around the world, can be used to determine the nature of the faulting associated with the earthquake, to infer the orientation of the fault plane and to gain information on the state of stress of the lithosphere. The result of such an analysis is referred to as a focal mechanism solution or fault plane solution. The technique represents a very powerful method of analyzing movements of the lithosphere, in particular those associated with plate tectonics. Information is available on a global scale as most earthquakes with a magnitude in excess of 5.5 can provide solutions, and it is not necessary to have recorders in the immediate vicinity of the earthquake, so that data are provided from regions that may be inaccessible for direct study. Figure 2.4 Quadrantal distribution of compressional and dilational P wave first motions about an earthquake. defined by the fault plane and the auxiliary plane. 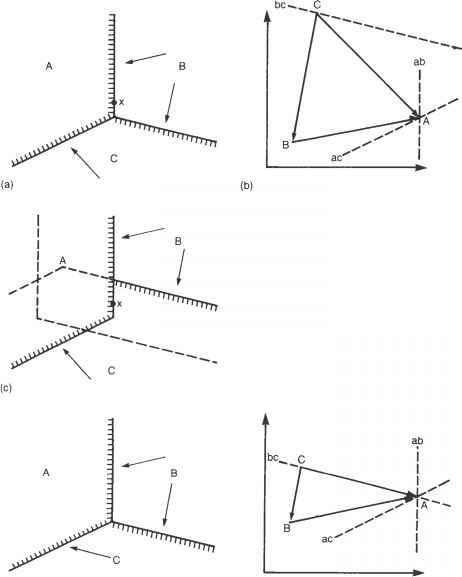 No P waves propagate along these planes as movement of the fault imparts only shearing motions in their directions; they are consequently known as nodal planes. Simplistically, then, a focal mechanism solution could be obtained by recording an earthquake at a number of seismographs distributed around its epicenter, determining the nature of the first motions of the P waves, and then selecting the two orthogonal planes which best divide compressional from dilational first arrivals, that is, the nodal planes. In practice, however, the technique is complicated by the spheroidal shape of the Earth and the progressive increase of seismic velocity with depth that causes the seismic waves to follow curved travel paths between the focus and recorders. Consider Fig. 2.5. The dotted line represents the continuation of the fault plane, and its intersection with the Earth's surface would represent the line separating compressional and dilational first motions if the waves generated by the earthquake followed straight-line paths. The actual travel paths, however, are curved and the surface intersection of the dashed line, corresponding to the path that would have been followed by a wave leaving the focus in the direction of the fault plane, represents the actual nodal plane. Figure 2.5 Distribution of compressional and dilational first arrivals from an earthquake on the surface of a spherical Earth in which seismic velocity increases with depth. by considering the directions in which the seismic waves left the focal region, as it is apparent that compressions and dilations are restricted to certain angular ranges. A focal mechanism solution is obtained firstly by determining the location of the focus by the method outlined in Section 2.1.4. Then, for each station recording the earthquake, a model for the velocity structure of the Earth is used to compute the travel path of the seismic wave from the focus to the station, and hence to calculate the direction in which the wave left the focal region. These directions are then plotted, using an appropriate symbol for compressional or dilational first motion, on an equal area projection of the lower half of the focal sphere, that is, an imaginary sphere of small but arbitrary radius centered on the focus (Fig. 2.5). An equal area net, which facilitates such a plot, is illustrated in Fig. 2.6. 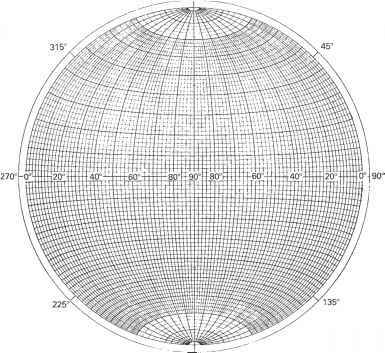 The scale around the circumference of such a net refers to the azimuth, or horizontal component of direction, while dips are plotted on the radial scale from 0° at the perimeter to 90° at the center. Planes through the focus are represented on such plots by great circles with a curvature appropriate to their dip; hence a diameter represents a vertical plane. Figure 2.6 Lambert equal area net. 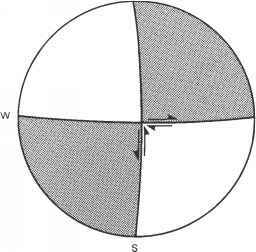 Figure 2.7 Ambiguity in the focal mechanism solution of a strike-slip fault. Regions of compressional first motions are shaded. first motions, respectively, left the focal region. A focal mechanism solution is thus obtained by plotting all the observational data on the projection of the focal sphere and then fitting a pair of orthogonal planes which best divide the area of the projection into zones of compressional and dilational first motions. The more stations recording the earthquake, the more closely defined will be the nodal planes. How are compressions and dilations formed in an earthquake focal mechanism?